I wanted to increase the performance of my .44 magnum rifle for short-range deer hunting with my 1894 Marlin. I determined that a 240 grain hollow-point could be seated out significantly further than the 1.610” OAL listed in manuals. I determined that a cartridge OAL of 1.850” just touched the rifling of my barrel, so I wanted to see how much extra performance I could get by seating bullets further out. I first determined though that a 1.850” OAL would NOT feed through my action. The longest OAL that would feed reliably was 1.710” so I used that as my benchmark. I made some dummy rounds without a primer and filled them with water to determine internal volume. A OAL 1.610” cartridge had an internal volume of 1.52 grams (1.52 cc at 25C), while the OAL 1.710” volume was 1.74 cc, a 14.5% increase in volume. This extra volume suggests that I MIGHT be able to increase powder capacity by 14.5%. Assuming that 24.0 grains of H110 is maximum for a standard cartridge, I MIGHT go as high as 27.5 grains of H110 with a 1.710” OAL cartridge. Since the cannelure of Remington bullets is positioned for 1.610” seating, a long bullet might recoil out of the brass during firing. I solved this by applying a second cannelure 0.120” below the factory one with a CH canneluring tool. My finished cartridges look like this. I tested 5 rounds each at 23.0 to 27.0 grains of H110 at 1.710” and 23.0 grains of H110 at 1.610” as a control. I measured velocity at 10 feet, accuracy at 50 yards, and case head expansion. Here are my results. 27.0 gr. 1949 1.35” .459”/+.001 Severe muzzle blast, too hot! I expected a greater increase in velocity, but achieving 1900 fps was OK. Going by the rule that case head expansion should not be greater than .001 inch, it looks like even the maximum load I tested is OK. I didn’t see any really flat primers in this run, so I didn’t evaluate them. The 27.0 grain load FEELS too hot, judging from the muzzle blast and the level of recoil. It just felt like the right place to stop. From its level of performance, and good accuracy, I am considering the 26.5 grain load for future deer hunting. Interesting, sort of a poor man's .445 super mag? Looks like some good results. How would you think you would lose out of a Ruger Super Blackhawk, 6" barrel? I don't know about the throats of a RBH, so I can't say if it will even chamber. I have a Taurus .44mag, and these rounds will chamber, but I haven't shot them in the revolver because I didn't see the purpose. I'm actually disappointed in the results. I expected a lot more increase in velocity. Oh well, wishful thinking. It might not be worth the extra effort to put on a second cannelure just to get 100 fps. Looking at my data, I should easily get 1800fps with 24 grains of H110 and the standard OAL. could ya'll list some loads for the .44 mag with unique & imr4227 ? i usto use IMR 4227 for the 300 gr jacket slugs but i do not rember the charge. all the new powders, that are listed for reloads, are not available now. I've never used either Unique or IMR4227. My other go to powder for smaller cartridges is Blue Dot. I've used that for everything from 38 special to 44 magnum. I load Lyman's 245 grain cast SWC with 16.0 grains of Blue Dot. That's a maximum load according to Lyman's load book. It's very accurate in my Taurus. The only other load I've developed with H110 is for the M1 Carbine, shooting Lyman's 130 grain cast soft point. I may get around to developing a Blue Dot recipe for it some day, maybe when I use up my single bottle of H110. But I'm not sure how or if any of this transfers over to a pistol type round. My Marlin rifle doen'st have a magazine, it is tube-fed. I haven't done it, but I've read that the feeding lever can be modified to accomodate longer OAL cartridges. That's true, but it's well documented that setting the bullet on the rifling may raise chamber pressure dramaticly. Bencher's are more interested in groups than velocity per say, so they develop loads accordingly. I carefully studied my data to make sure I wasn't going too high over-pressure. It seems though that my Marlin has a lot of free-bore, so even with these extended length cartridges, they're still not in contact with the rifling. This "cartridge" has already "made meat" and I'm totally satisfied with it's performance in the field. This 240 grain hollow-point seems perfect for those animals hoofing around my property. i had not seen any powder on the shelfs for months, last week they got in some hodgon clays. but no blue dot. i was wondering more about what ammount of powder some one uses with a 300 gr jacketed .44 i have several boxs of these but dont nowe what or how much to load them with. 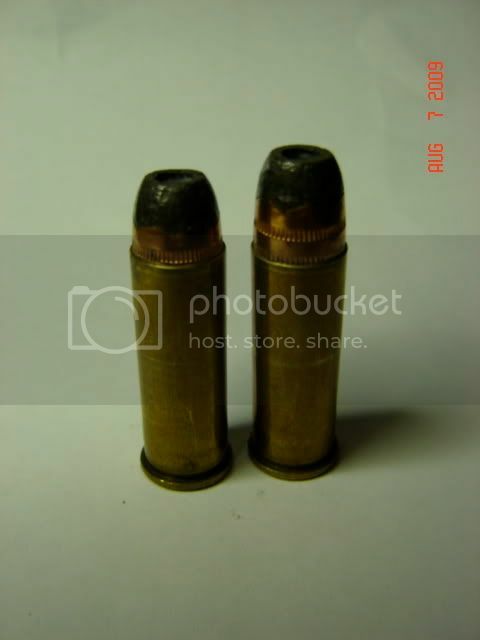 there is some info on other sites about loads for the .44 but i cant get any of the powder they use. I was wondering more about what ammount of powder some one uses with a 300 gr jacketed .44 i have several boxs of these but dont nowe what or how much to load them with. You need a reloading manual. My 8th edition Hornady manual lists 12 grains of Blue Dot as the max load with their 300 grain bullet, or 20.1 grains of H110. a friend told me to use 20 gr of imr 4227, as this is one powder i do have, but he dosnt nowe the velocity it sends the bullet out the barrel. he has a factory pack that says they are sending 180 gr jhps at 1700, thats fast for a .44 mag but we dont nowe what length of barrel its rated from. I have seen several magazine fed firearms with chronic feed problems.... However, I have seen several lever actions with a total lock up due to ammo that would not function through the feed system from the tube. That's true. I've got two Marlins, one in .357 magnum, and the second in .44 magnum. If I try to shoot 38 special full wadcutters through the .357, it will jam to the point the action needs disassembly. But, any regular load longer than 1.495" (38 with Lyman's 358477 SWC) will feed just fine. All .357 loads have been fine. My extended length .44's still feed also, so that's not a worry. My .357 is micro-groove, while the .44 is Balard. I still shoot cast lead in the micro-groove to 1800 fps, without serious accuracy loss. Maybe I just got lucky. Sorry, but I'm a "Murphy's Law" kinda guy. I think that's just an accident waiting to happen. I know that the new "leverution" bullets have polymer tips that make that safe, but I'm too cheap to buy them. I'll just stick to flat tip cast I can make myself. BTW, I can also make jacketed bullets from scrap .380 auto, and .223 cases, so I'm not inclined to buy any jacketed bullets for my Marlins. No plans what-so-ever, modification wise. Don't get much past stock refinishing, or drilling and tapping scope screws.